Approximately 6.5% of the historical school roll were Essex girls. The figure is a guesstimate because the birthplaces of some 10% of the historical roll are at present unknown. Additionally, Essex is one of the four counties abutting London so the boundaries are rather flexible. A degree of second guessing has to be done even when Essex is stated as a home county. The opposite boundary of Essex is fortunately pretty clear cut because the map turns blue where the land meets the sea. So we know where Essex stops on that side at least. And we know that of those 6.5% Essex girls, five came from one small town near-ish to an edge that is wet: Rayleigh. Situated just off the A127, near to Southend, the market town of Rayleigh is 32 miles east of London. The name Rayleigh means the clearing of the deer – rǣge (roe deer) and lēah (clearing). 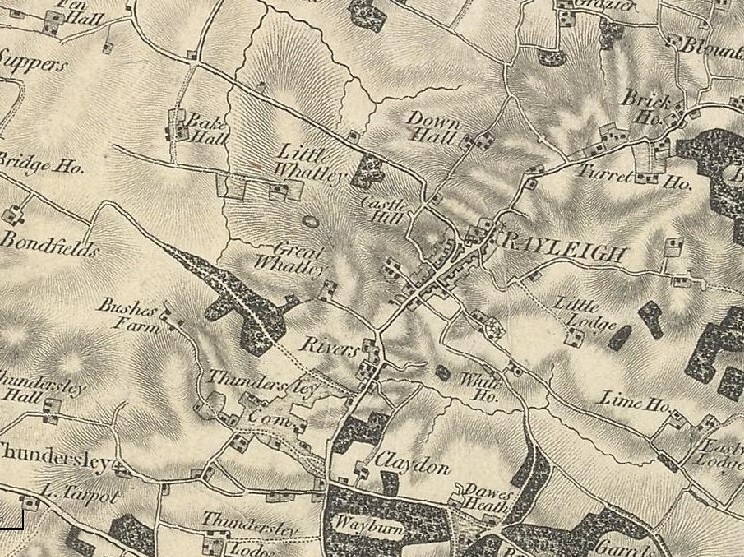 The land around Rayleigh was a royal hunting forest so, if the king comes a-riding and there is nary a deer to be found, he’s going to be a tad cross. It made sense to help nature along and ensure there was good hunting to be had. There is a tenuous connection with a deer area and the school on its present site. An area in the school grounds known as the Dell may have been where deer were over-wintered. Certainly when Park House was purchased to build the School, it was advertised as being situate in a deer park although the deer were moved out when the School moved in. 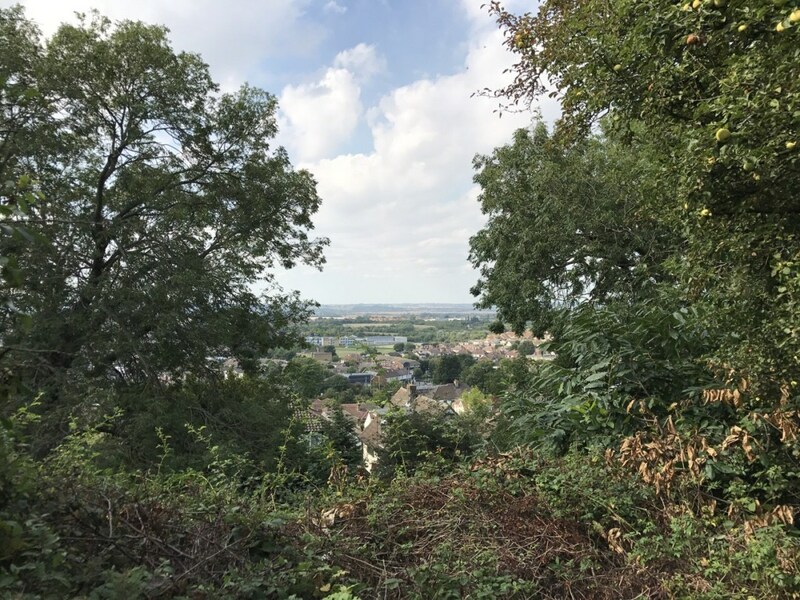 Rayleigh is mentioned in the great tax document known as the Domesday Book and listed as having a castle, which appears to have been in ruins by the 13th century. Indeed some of the stones may have been used to build the church. All that remains is the medieval mound now in the care of the National Trust and which affords a good view of the surrounding countryside. The families of the School’s Rayleigh pupils at one point lived in the High Street. As they were born in the same period, and their fathers were both members of the Lodge of True Friendship, it is possible that they knew each other. However, that remains as speculation and the most we can do is place them, for a brief period, in the same place at the same time. It is time to meet the families: Noone and Kernot. Anne Linggood Noone and her older sister Betsy Ann were two of the 13 children of John Loton Noone and his wife Elizabeth Hunt Noone nee Linggood. Anne, b 1830, became a pupil in 1839 and left in 1845. In fact in 1845, she was “at home ‘ill’; a bible and prayer book and some clothing delivered to her father”. Nevertheless, she was of the right age to leave (15) so it does not appear to have been the illness that caused her departure. Betsy, six years older (b. 1824), arrived as a pupil in 1833 and left in 1839. In fact, the two Noone girls were not in the School together as Betsy left in February 1839 and Anne arrived in April. So, keeping strictly to the rule that sisters were not permitted – a rule that was frequently broken in any case – the Noone period of residency was 12 years: 1833-1845. The Kernot Three did not overlap with the Noone Two as the Kernot girls were slightly younger but it was another large family with 7 children. Mary Ann Kernot was born in 1833 and she is listed at the School in the 1851 census (and in 1861, 1871, 1881 and 1891 too but we get ahead of ourselves); Louisa Catherine, b 1840, appears in the 1851 census at the school listed as Catherine which suggests that this was the name by which she was known. Sadly she did not make old bones as she died in 1875. It may be her listed in 1871 as being a patient in Bristol General Hospital although her place of birth is given as Maldon, Essex so the jury remains out on that one. The last Kernot girl to be a pupil was Kate Charlotte who was born in the year Anne Noone left the School. The rule of no sisters was frequently broken but the rule of indigence was much more strictly adhered to. It was, after all, the raison d’etre for the Charity. In practice, most of the indigence was as a result of the death of the father but it was not a perquisite that the father must be deceased and John Loten Noone wasn’t. At least not whilst his daughters attended as pupils. We have to assume that his indigence was connected to his numerous progeny. a saddler and harness maker by trade, he died in 1846, by which time both his daughters had left the School. The Noones were also connected to printing. Charles Clark Noone, paternal uncle to Anne & Betsy, was a printer and hairdresser [an interesting combination!] and it was he who printed the pamphlet in Rayleigh in 1821 in support of Queen Caroline. Digression for a brief history lesson. The Prince Regent married Caroline of Brunswick. The marriage was a failure although they managed to produce an heir (Princess Charlotte) before going their separate ways. Both behaved scandalously but George held what he thought was a winning hand. He introduced a Bill of Pains and Penalties designed to rid himself of Caroline before his coronation as George IV. Unfortunately for him, the general populace was pretty much behind Caroline so the failure of the bill was accompanied by enthusiastic celebrations. It was to no avail as Caroline was locked out of Westminster Abbey whilst George was crowned. Shortly afterwards, she left the country and died abroad. Their daughter grew up to marry but died giving birth to a son who also died, thus creating the race for inheritance that resulted in the birth of Queen Victoria. Rayleigh celebrated the defeat of the Bill with a bonfire and fireworks and ‘at 6.30 p.m. on the 16th November a cannon was fired to announce the start of the festivities and “the windows of all the inhabitants….were instantly lighted; the bells commenced ringing a merry peal; a large bonfire was made; the effect was truly grand” ‘(reprinted in Rayleigh parish magazine, April 2018, p6 http://btckstorage.blob.core.windows.net/site2742/Documents/Magazine/MagazineApril%202018r.pdf ). A band paraded through the streets and perhaps more to the point ‘fifty-four gallons of strong beer were distributed among the poor inhabitants, and the people in the poor-house were regaled with plenty of meat, bread and beer’ – so clearly everyone had a good time. The Kernot father, George Noyce Kernot, was a chemist (chymist) and druggist and he, like John Noone, carried on his business in the High St, Rayleigh. In 1841, the Noone and Kernot families were both residing in the High St. Mary Ann & Louisa Kernot and Betsy Ann Noone were therefore all in the same place at the same time. Thereafter, their lives were divergent. Anne Linggood Noone is the only one of the pupils still in Rayleigh in 1851. Then she disappears from trace until a fleeting reference in the will of one of her brothers which places her as a spinster in Southend in 1864. We don’t know what happened to her after that. Her sister Betsy married in 1847 and, by 1851, had moved with her draper husband to Romford. They were doing well enough for there to be two servants in the household. After this, she too vanishes. As husband and children also fall off the research radar, it is possible that they went overseas. Brother Alfred went to Australia so it is quite feasible that Betsy and her husband also went and so they have not been traced. The Kernots, on the other hand, apart from Louisa who died in 1875, are much more visible. Mary Ann, as hinted earlier, stayed on at the School, eventually becoming Matron. She retired in 1895 after 43 years’ service and received a pension of £60 pa. In 1901, she was in Shoreham as a retired Matron. On 25 July 1909, aged 72, she died, her probate giving her address as College Rd, Ripon and granted to Abraham Bowerman Kernot, her nephew. As her brother Abraham had also lived in Yorkshire, it may well be that Mary Ann moved north to be with him, particularly since he had married late in life and his wife died giving birth to their son so he had a young child to look after. Kate Kernot, on the other hand, did marry (1873) – William Cooper, a draper by trade. In all the remaining available census returns, Kate is at different addresses but always in the South East: Hackney, Woodford, Streatham, Balham. In 1923, she died, her address given as 39 Trouville Rd, Clapham Park. Probate was granted to Kate’s son, Maurice. Her estate was worth a tidy sum – £3014 10s 4d with a further grant in 1925 [amount not given] which is the equivalent today of £66,000. Mary Ann too left a very respectable amount, the equivalent of £108,000. In fact all the Kernot girls who reached maturity were comfortably off if we judge by their probates. Images of College Rd, Ripon and Trouville Rd, Clapham Park both from Google Earth and showing some of the substantial Victorian/Edwardian housing that would have been there in Kate and Mary Ann’s time. The Kernots and the Noones feature in a variety of wills as testators and beneficiaries so it is quite possible much of their estates were inherited and then passed on to another of the clan in turn. Like so much about individual pupils we have tantalising glimpses into their lives which leave us wanting more!